Maybe you’re a fan of riding alone indoors sweating away on a noisy turbo trainer; if so then this isn’t for you. Personally I’d much rather carry on riding outside with my friends on real roads. After all here in the UK we still get some really nice sunny days during winter (it’s not all rain and dark cloud) and don’t forget the clear starry skies on a frosty evening. 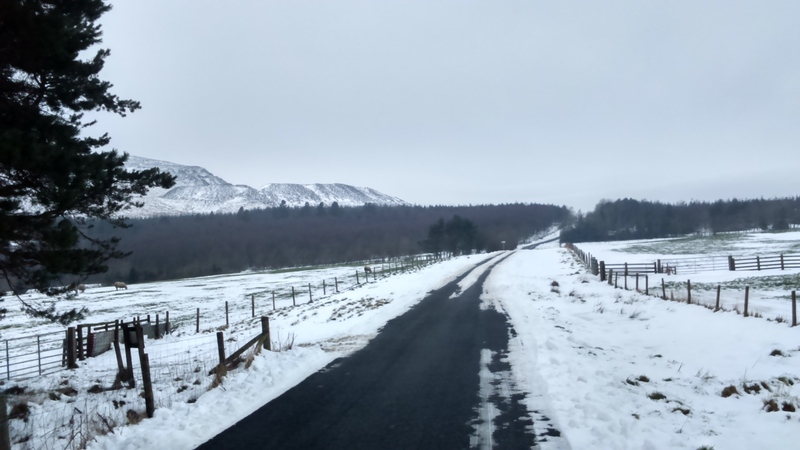 So here’s my 10 ways to stay warm on the bike this winter! Layer up. It’s surprising how warm you can remain with just your usual riding kit and a couple of additional layers. This way you probably have a lot of kit that you can wear straight away without needing to add extra expensive winter items. Compression baselayers come into their own here; because a compression layer is extra close fitting you can still fit a more ‘standard’ baselayer on over the top. Add a Jersey on top of these layers and you’ll be nice and snug for cool temperatures. You can always add a slim jacket or gillet for an additional layer when things get particularly frosty but you’ll probably find that there’s no need. I use the SubSports compression baselayers on both my top and legs; I can wear the compression legs under my summer bibshorts. If you plan to do this then obviously try to colour match! Try a Gillet. This is actually something that I don’t currently have in my wardrobe. But something that I definitely would wear if available. Keeping your core warm on particularly cold rides is really important. And a gillet will do this without restricting your movement. 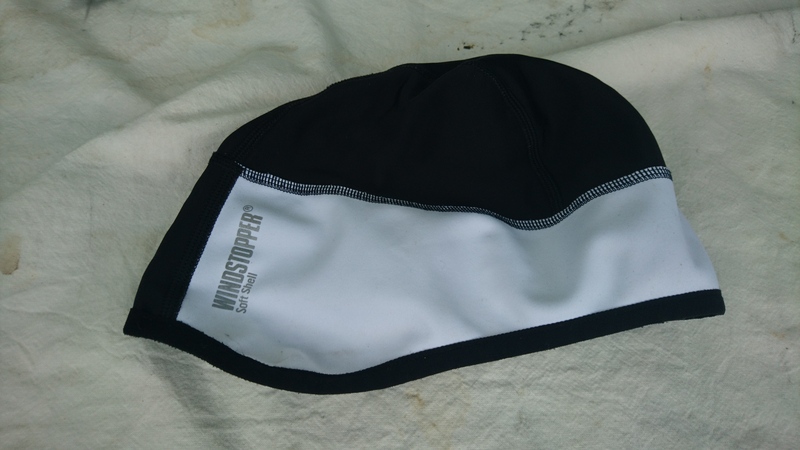 Something like the Proviz Gillet can be used to keep you very well seen on dark rides too. Overshoes are a ‘must’. Get some thick thermal ones if your feet get cold easily. Don’t be tempted to layer up your socks instead as too much ‘sockage’ will squeeze your feet and stop the blood flowing through them as effectively, making things worse not better. 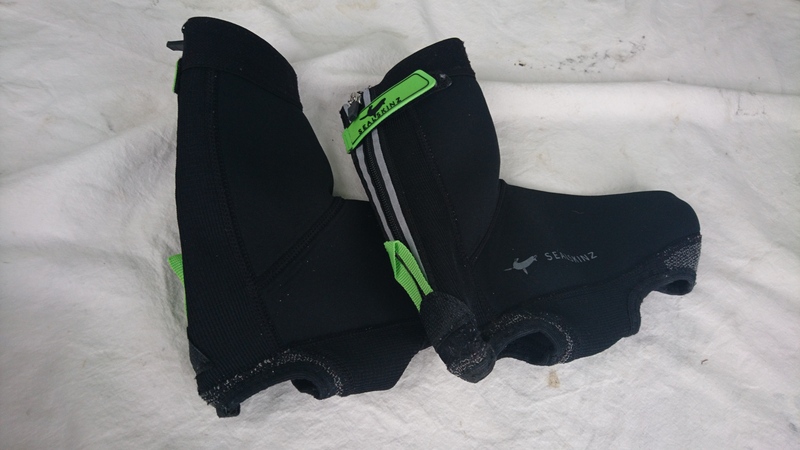 Overshoes will also keep your shoes cleaner and drier; drying out a soggy pair of cycling shoes can take ages in the winter, if you can keep them dry then you can keep on riding. I use Sealskinz neoprene overshoes myself. Socks – but on the outside! Cover your head and ears. They may look really, really silly without your helmet on but just make sure to put your helmet on as soon as you’ve got the skull cap in place and take it off as soon as you take your helmet off. Like toes and fingers, ears have a tendency to get cold quickly and so covering them with a suitable skull cap will help keep them from becoming blocks of ice. Glasses can be an issue though, once you hide away your ears you’ll have nothing to hook the arms of your cycling glasses over! This means you’ll need to put your glasses arms inside your cap and therefore inside the helmet straps too (unfortunately this is a cycling faut pas). My cap is a Gore Windstopper. Consider wind resistance. I’m not talking about training into a head wind; I’m talking about wearing a top layers that have a degree of wind resistance. You’ll be amazed at how cold you can be riding into the wind on a cold windy day and yet quite warm with the same wind behind you. It really does make a big difference cutting out the cold breeze! It’s worth keeping a variety of gloves for different levels of cold. It’s not nice wearing really thick gloves, you just can’t do stuff as well with them on. 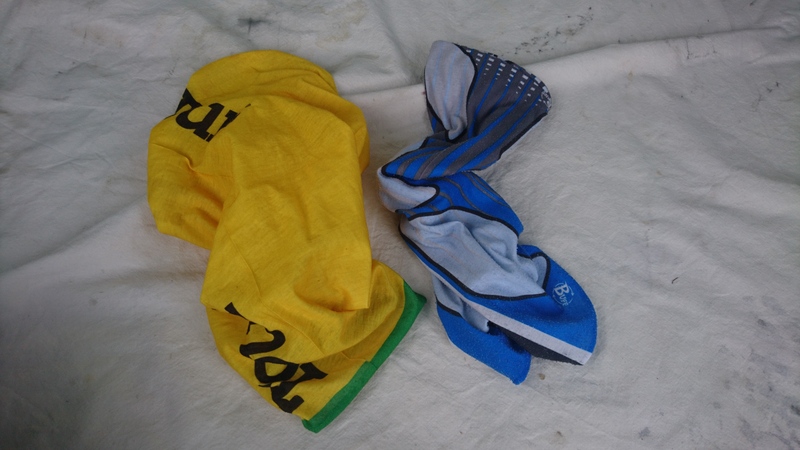 From reaching into your jersey pockets, to changing gear everything is just less easy. However you also don’t want to have freezing cold fingers, it’s just as bad. So I’d recommend 2 or 3 pairs of gloves of different thicknesses for the different depths of winter, allowing you to choose the right amount of protection for the right level of cold. Like socks, I’ve tried layering gloves and find that it really doesn’t work so well even with a proper pair of ‘under-gloves’. 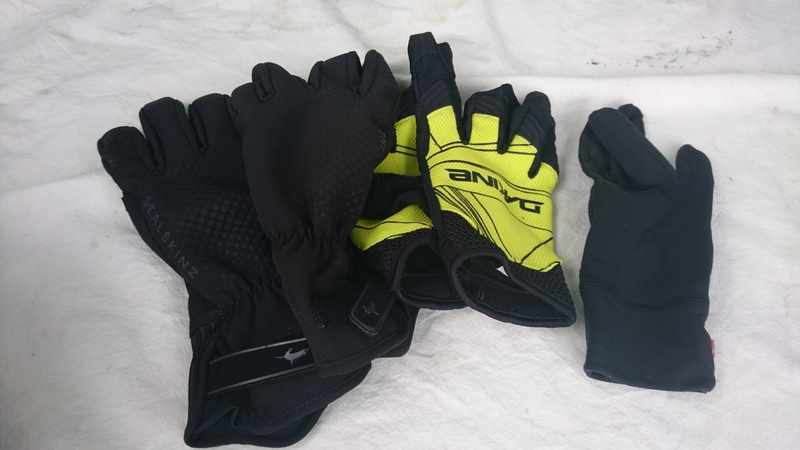 I choose a pair of Sealskinz All Season gloves for most conditions, Dakine who make my long finger summer gloves offer a good variety of options including ski gloves if you suffer from really cold hands. I don’t have this many hands! Buffs – often available as freebies – on the front of magazines, at shows etc. Wear two at once for ultimate neck warmth. I always put on a buff before my top layer jersey when it’s cold, that way it keeps me snug under the zip area of the jersey; fewer drafts. Then if it’s really sub-zero I may add another buff on top for maximum warmth. Will you need to stop? Is this a ride where you’ll warm up a lot or a slower social one? Is it likely that you’ll need to stop? These are questions that you need to ask yourself when considering what to wear or how many layers. This is easier on your own if you plan to ride all out but less easier to gauge if you are joining a social ride. What’s warm when your heart rate is up above 150-160 bpm is not so warm down at 130 bpm. Also the larger the group, the more likely you’ll need to stop, this maybe for a mechanical among the group or while waiting for someone to catch up on a hill climb. Plan an extra layer for your pocket if you may need to stop. 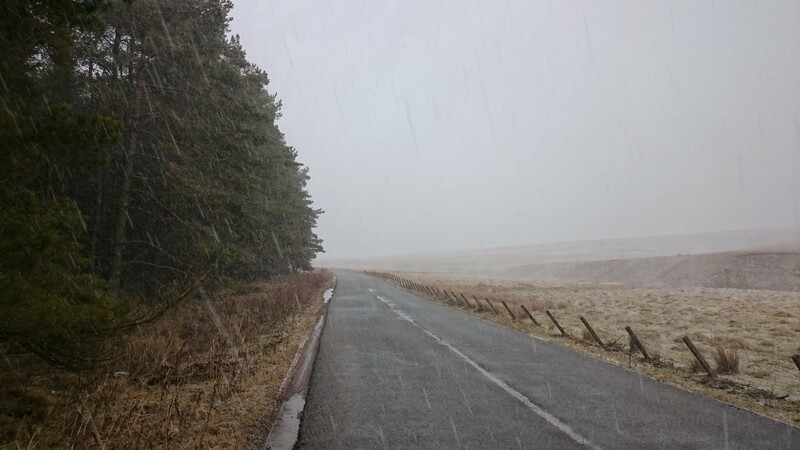 Plan ahead – Warm your clothes on the radiator ahead of the ride for maximum comfort. This is something I realised when I accidentally left my kit in the garage and had the opposite experience. If you’re putting on cold clothes then you’re starting from a bad footing. Sure, the warmth in the clothes will soon dissipate but by that time hopefully you’ll have started to warm up from exertion anyway. Did someone say ten? Sorry that was just a ploy to get you reading. People like top tens and things like that. But why aim for 10 as an arbitrary number? You either end up adding extra pointless suggestions just to make it up to 10, or missing out useful ones to keep it down to 10. I’d much rather offer 7, 8 or 9 real thought out remarks than aim for the arbitrary 10! Oh and look out for my next post on winter – 10 ways to stay safe on the dark slippery roads.